The other day I cast about for a comfort book, something pleasant to read in the tub after a busy day. Usually that would mean an Agatha Christie mystery for me, all of which I reread for the umpteenth time. But that evening I didn’t even feel like dealing with their mild malice, even though it is always triumphed over in the end. Instead, a flash of insight reminded me of Ted Kooser’s Local Wonders. Yes! That’s exactly what I needed after a long and cold day: a comfort book. This slim volume of seasonal essays by one of the U.S. Poet laureates and Pulitzer Prize winners is the most unassuming book, a quiet gem of brilliant musings on everyday life in the Nebraska country side. 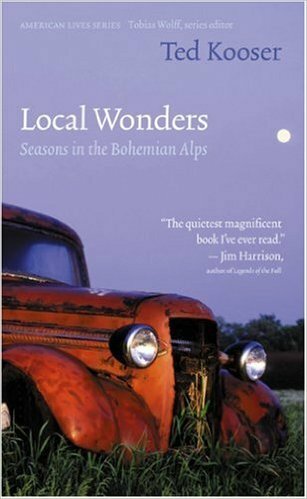 It warrants rereading whenever a new season comes around as it did that day for me with winter’s first delivery of snow and ice. “Walking our gravel road early in the morning, the sun so slow to rise into the silence, slow to ignite the pure fuel of the air. This is a morning like a roadmap, pink and blue, the destinations only lightly penciled. “Suddenly a crow shakes loose from a tree and flaps away cawing, five slow croaks like a frozen starter motor. Coarse frosty pastures, gray as coyote skins. A magpie, far east of its range, rises and falls with each deep wing bear – a black stone skipped across water. Thanks for pointing it out, Annette!